I thought that this sign would go great on the blog. It's been going around the mission and it's hilarious. There is a lot of anti-Mormon around here, but I can't believe a church would put that up on their sign. Yesterday we had 2 people show up to church! One of them was Richard, a older man in his 60's, that we have been trying to commit him to baptism every time we meet him. I was surprised to see him there at church when we pulled up. After sacrament meeting he said that the service was really quiet, not like the other church that he goes to that is really loud and moves you. So he want us to go with him to his church this Saturday. I think it is a baptist church, so that will be fun, but then we can talk about what was felt at our church and what he felt at his church and hopefully get him to recognise the spirit. Angela FINALLY came to church. Saturday we helped her put some window a/c in her home, so we knew where she really lived. We usually meet her at her ex-fiance's house where she watches her daughters all day. So we committed her to come to church Saturday night, called her a 8 am before church to wake her up, and then finally ended up knocking on her door to wake her up, but she came and stayed all 3 hours. 2 of our investigators ended up moving out of town last week, Mitch and Quinton and Melissa. I was bummed about it but Elder Wilson and I have been doing a lot of finding and now have added 8 new investigators to our teaching pool. Two of the more solid ones are Carl and Arnet. Both are looking for direction and answers, we are so excited. One of the members in our branch, Bro. Near also gave us a referral a couple of days ago (his name is Travis, please pray for him specifically by name) and we are trying to set up a appointment today at Bro. Near's home to teach him. We have been so blessed the last couple or weeks, miracles are taking place and it's just a blessing to be a part of it all. Things are going well. We had zone conference this week down in Peoria again, it was President's last zone conference. It was hard to say goodbye to him. He has helped me out so much and right when we got know each other real well he has got to go and now I need to get used to the next one. But I did get the CD I was talking about the other week, the one from all of us missionaries going to Nauvoo for zone conference. Its way cool. I'll be sending that home in the near future. Sorry if I am very random and sporadic when I write you back, I get your letters early in the week and then totally forget most of what you had asked me about by the time Monday rolls around, so I brought your letter with me this time. I did get the shorts you sent, and THANK YOU for sending them, doing service with jeans on stinks. I sent the shirts off last Monday, so they should be getting to CTR clothing today. We'll see if they can get back to me soon. I was thinking about one thing this week that would be cool to have, Rachel you might help me out with this, the sound track to the RM. That would be great. Saturday I think I had one of the meanest street contacts in a long time. There was a old black guy sitting on his porch and we shouted at him and he motioned up to come up on the porch. He was clearly drinking at 11 in the morning and so he went off about how many bibles he had sitting right there is his window. He also had a Book of Mormon, so we started to ask him about it. He suddenly started talking about all of us being brother even though we had different colors of skin. He then went off on a tangent about how there is a black man on the white house and how long it took for them to get there. As he said it, "...we came from the outhouse to the white house...and we are going to stay there for the next 200 years!" (this whole time we couldn't get in a word) He then proceeded to tell us that he came from a gang in Chicago and was a "thug" many many moon ago. And to cap it all off he said that if he ever sees us on that street again he's going to, and I quote, "...chitty chitty bang bang us" And then threatened to beat us up if we didn't get off his porch. All of this is coming from a 70+ year old man who hasn't been sober this whole year thus far. So I think that was the highlight of my week. There are some more but I don't have enough time to write them. As for Investigators, none came to church, none are progressing at this point and none will keep a commitment. Its a shame really, I get pretty bummed about it every week, but hey its not my choice to deny salvation, I gave them the opportunity every week. So we are thinking we are going to have to do some weeding with our teaching pool and start planting some new seeds. We already taught a guy named Carl who whole-heartily believes every thing in the Plan of Salvation, so it's already looking good. I've got to go but you should be getting a package from me for Fathers day, and thank you for the pictures of the wedding It looked fun. Training is going great. 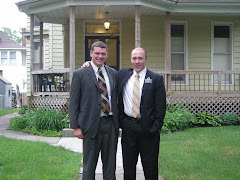 My new companion is Elder Wilson. He's from Preston, Idaho, at least he is not from Utah like my other companions. 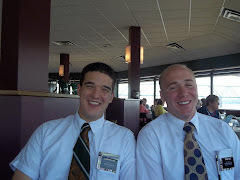 I forgot how green I was when I came out of the MTC, the questions he has are funny. But as for me, it look like I will be here around 12 weeks training him, so don't worry Mom, I'm not going anywhere. The investigators we have committed to baptism are just not showing up to church. Mitch committed (as usual) he would be at church and we even were able to sit down with him this last week and talked more about baptism and taught a few commandments. But he did not show. Angela, we also committed her for church for the third week in a row and were able to teach a lesson about the priesthood, and recognizing the spirit, but she was did not show. Justin I don't think is going to be able to get baptised this month. He wants to be baptized, but keeps falling through on our appointments. His mom, Barbara is excited for him to be baptized but it's just not a priority. The latest person we have committed is Lakeena. She is the most sincere, I think personally, and the only one that is really pondering about what we teach her. When we committed her to baptism she said that the only thing that we need to go over is Joseph Smith. That is the only thing that she is hooked up on, and basically the whole existence of our faith and church. So we are going to hit it on the head Wednesday with the next appointment. This morning I heard a couple things off a CD and really started to think about it. I'm going to start changing and adjust my teaching solely (? 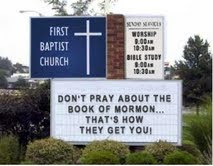 how ever you spell that) to just The Book of Mormon. I need to get excited about The Book of Mormon, and if I can show how excited I think my investigators will be just as excited as I am in the Book of Mormon. And once they are excited about the Book of Mormon they will read, and learn to love the Book and learn all the plain and precious things that Nephi talks about. And then the spirit will touch their hearts and they will know that it is true. 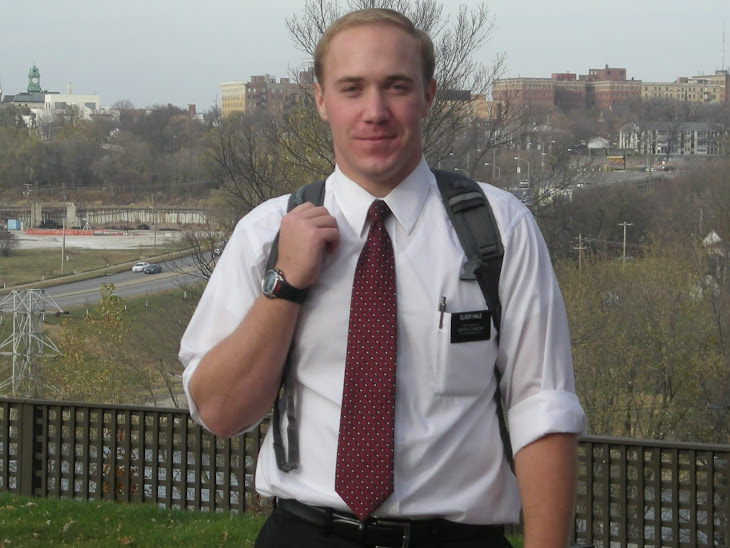 I truly feel like people are loving me and not the Gospel or the Book of Mormon that I bring into their life. p.s. I forgot to tell you, I went to a Catholic mass last night....crazy stuff but I now have a former investigator's e-mail. He was training to be a catholic priest so I'm going to e-mail and convert! So for the big news...I am not leaving Clinton. Elder Thurman is leaving after being here for only 6 weeks. But, I am training! Tomorrow I get to go pick up my brand new greeny missionary right from the MTC. So I'll let you know how that goes. So I will be staying here for at least 8 more weeks because we are merging with Iowa, Des Moines Mission. So now you know I will be apart of the Des Moines Mission for the rest of my missionary career. But, we have 3 baptism dates and finally had 2 people show up to church on Sunday, Mike and Melissa Murphy, Ill give you the details of every thing next week. We're running a little late today.